Despite vowing not to cooperate with President Donald Trump’s immigration agenda, Washington state has regularly been giving out personal information used by ICE to arrest and deport people. After The Seattle Times raised questions, the governor told an agency to stop. Few states have been as forceful in their opposition to President Donald Trump’s ramped-up immigration-enforcement policies as Washington. Yet, 20 to 30 times a month, a state agency has been giving residents’ personal information to federal immigration-enforcement officers — information used to arrest and deport people in keeping with the president’s policies. Most people wouldn’t expect Washington’s Department of Licensing (DOL) to hand over information to federal authorities just for the asking, since it is among a minority of such agencies around the country to allow undocumented immigrants to get driver’s licenses. The licensing department has regularly been providing Immigration and Customs Enforcement (ICE) with photos and driver’s-license applications, according to department spokesman Brad Benfield. Until questioned by The Seattle Times this week, Gov. Jay Inslee’s office didn’t understand the extent of the cooperation, said spokeswoman Jaime Smith. “We’ve asked them to stop what they’re doing at this point,” said Smith of DOL officials, though exactly how the agency will handle requests from immigration enforcement officers is still to be determined. 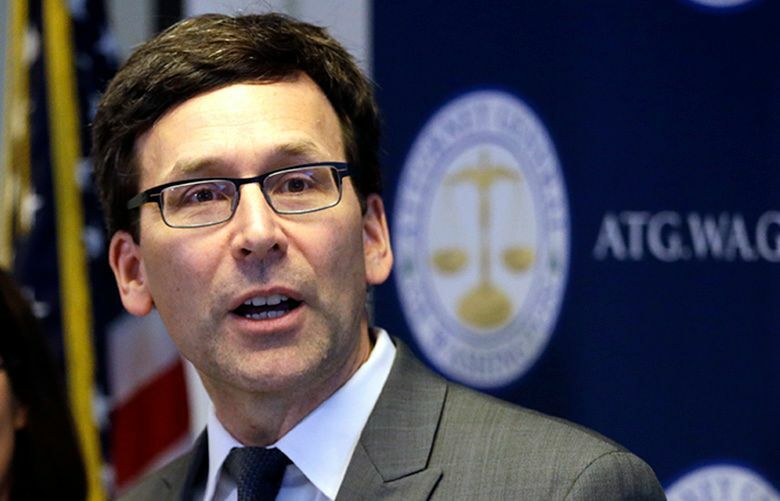 State Attorney General Bob Ferguson, a fellow Democrat, also demanded privacy for undocumented immigrants, among others, by suing Motel 6 this month over its alleged release of guest lists to ICE agents. “Folks wouldn’t even know their information was turned over,” he said. When DOL gives information to ICE, it redacts a field on the driver’s-license application showing whether someone has a Social Security number but leaves visible fields showing where someone was born (possibly a foreign country) and the ID used (sometimes foreign passports or other documents). ICE uses that information as evidence that someone doesn’t belong in the U.S.
Another ICE arrest report — an excerpt of which was given to The Times by one of four local lawyers who described DOL data showing up in arrest or deportation proceedings — noted a man they encountered at a Vancouver, Washington, apartment complex had used a Guatemalan passport to apply for a license. The role of states in immigration enforcement has never been more contentious. Acting ICE Director Thomas Homan recently told California to expect “a lot more special agents, a lot more deportation officers” due to legislation limiting the state’s cooperation with his agency, and said politicians there who support the policy should be arrested. U.S. Attorney General Jeff Sessions already has sent letters to Seattle and King County, among many jurisdictions across the country, threatening to withhold criminal- justice grants because of local sanctuary policies. It was in the name of public safety that Washington continued giving driver’s licenses to undocumented immigrants after Congress passed the 2005 Real ID Act, which says licenses issued without proof of legal status cannot be used to board planes and enter federal buildings. At one point, Washington was one of only a few states to give licenses to such immigrants, and now is among 12, plus Washington, D.C., and Puerto Rico. Washington got an extension until October 2020 to comply. DOL plans to begin marking regular driver’s licenses (as opposed to “enhanced” licenses requiring proof of legal status) to indicate they cannot be used as federal ID. While at least two other states issuing licenses to undocumented immigrants keep a tighter hold on information, DOL officials — initially — said their practices are legally required. Yet state and federal laws they cite say data “may” be shared with law-enforcement officials. There is no mandate. “It’s something you’re choosing to do,” said Matt Adams, legal director of the Northwest Immigrant Rights Project, referring to state leaders. They should take responsibility for that, he said. Interviewed before Inslee’s intervention, DOL Deputy Director Jeff DeVere said the department treats ICE no differently from any other law-enforcement agency, and is not “working hand in hand” with federal authorities “to root out who may be here illegally.” He said the department’s practices are long-standing. He stressed DOL won’t provide “database dumps” that allow ICE to search for, say, everyone born outside the U.S. It will only respond to requests about specific individuals when given a name and a crime officers are investigating. Most people think of murder, assault, burglary and the like when they think of crimes, but some immigration violations are also crimes. Entering the country improperly is a misdemeanor and returning here after a deportation order is a felony. And ICE officers might cite an immigration crime when requesting information from DOL, according to state officials. Scott Marks, an attorney who estimates he has had at least four clients whose DOL data were shared with ICE, said he understands most people would want the department to supply data that helps catch dangerous criminals. Are people who commit immigration crimes dangerous? “I would argue no,” he said. Nor is DOL responding to any new pressure from the Trump administration, according to DeVere and other department officials, who say the number of ICE requests for information has not gone up over the past year. It’s unclear why immigration lawyers, who have long suspected DOL of giving information to the feds, are now seeing documentation of it. “What might be new is what ICE is doing with (the information),” said Ruthie Epstein, an immigration-policy strategist with the national ACLU. ICE spokeswoman Lori Haley, responding by email to questions about the agency’s use of licensing data, did not say whether that is the case. But Kyrka and another immigration lawyer, Virginia Urenda, described arrests last year in which it seemed that very situation occurred. In both cases, ICE officers were pursuing one person at an apartment complex but ended up arresting a neighbor, or in Kyrka’s case two neighbors, after getting DOL information showing they were born in other countries. Access to that information is a “huge deal,” Kyrka said. The first step in deportation proceedings is to establish whether someone is an American citizen. The government has the burden of proving the person is not — unless it can show the individual was born outside the U.S., in which case it’s up to the person to prove citizenship. California’s Department of Motor Vehicles redacts information about what ID was used to get a driver’s license and has no information to give about where someone was born, said spokesman Artemio Armenta. California’s driver’s-license application doesn’t ask. Kyrka said she had no idea why ICE officers chose to ask DOL about her clients. Urenda said the ICE officers in her case saw her client’s truck parked in the Vancouver parking lot they were staking out. The officers “ran the plate,” according to the arrest report, and got the name of the registered owner. They can do so without contacting DOL, through a couple of databases available to law-enforcement officials. They would have had to email the department to learn that the truck’s owner had a Guatemalan passport. The officers did other record checks with unspecified databases to determine there was no evidence of the man’s legally entering the country, according to the arrest report. The agents waited for the man to get into his truck, then questioned him about his legal status and arrested him, according to Urenda. In another case of Kyrka’s, ICE submitted DOL records as an exhibit in immigration court. Her client’s driver’s-license application, signed as they all are under penalty of perjury, said he was born in Oaxaca, Mexico. “That was the biggest piece of evidence that my client was born in another country,” she said. When officers seek licensing records, they email DOL’s License Integrity Unit, which investigates fraud. Employees check that requests come from official email accounts, not personal ones, and cite an alleged crime, said department spokeswoman Christine Anthony. No evidence or grounds for suspicion is required. During business hours, the unit responds within an hour. To achieve the law’s objectives of getting everyone licensed and insured, Illinois officials promised they wouldn’t turn over information for immigration-enforcement purposes without a subpoena, said Nathan Maddox, senior legal adviser to Illinois’ Office of Secretary of State, which handles driver’s licenses. And even then, the secretary of state reiterated after Trump’s election, his office would ask the state attorney general to fight the request. Shortly after Trump was elected, Inslee directed his staff to figure out what data the state collected that the feds could use to learn someone’s nationality or citizenship status. DOL briefed the governor’s staff on its practices, and was not told to do anything differently, DeVere said. Smith, the Inslee spokeswoman, said staff who took part don’t remember details coming up that portrayed how much information DOL was sharing. “A lot of focus was on Social Security numbers,” she said, which the agency does not share. Inslee’s office is now asking a lot more questions, she said. One question is whether any federal grants require information sharing. Another is what ICE is telling DOL about the crimes allegedly committed. Are they really just crimes related to entering the country illegally? Or are there other crimes involved, such as drug trafficking? If the former, that’s a problem, Smith said. 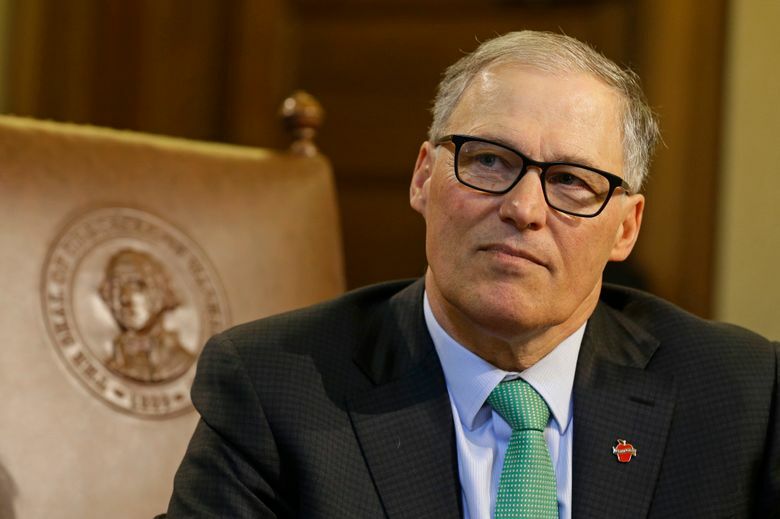 For now, Inslee has told DOL to refer information requests from immigration officers to the governor’s general counsel. A lot of people are reviewing the issue, Smith said. That includes staff in Ferguson’s office, the attorney general said in a brief interview Thursday, declining to comment further until he knows more. State officials might want to talk to Aburto Gutierrez, whose arrest following an interview with The Seattle Times prompted Inslee to call ICE’s acting director, expressing concern about freedom of the press. The 35-year-old Ocean Park resident has no criminal record, according to his ICE arrest report. In a series of interviews, he said he harvested clams for roughly 15 years in Pacific County, where ICE agents have recently been taking away dozens of longtime residents and employees, upsetting even some Trump voters. Aburto Gutierrez said he worked almost every day, “30 days a month,” and supported his longtime girlfriend and their children, who are American citizens. That’s not the type of person ICE would have gone after during President Barack Obama’s final years in office, when he directed the agency to focus on serious criminals. But Aburto Gutierrez is fair game under Trump, who has said that no one living illegally here is exempt from deportation. ICE officers first encountered the Pacific County man while arresting his girlfriend last June. They didn’t arrest him then out of concern for his children, who were put in his care, according to the arrest report. But the officers continued to gather information, netting the nugget from DOL about his Mexican birth certificate. The officers also said in the report that they discovered Aburto Gutierrez had applied for either a type of ID given by Mexican consulates or a CURP card that is Mexico’s equivalent to our country’s Social Security card. They didn’t specify which. Luis Mingo Nyssen, a spokesman for the Mexican consulate in Seattle, said staff “absolutely” do not give out any information about their IDs. But he said information about CURP cards is available online, in Spanish, to anyone with information about an individual, including where that person was born. ICE officers arrested Aburto Gutierrez early one morning, a few hours after he got off work, as he was heading to a grocery store for coffee and eggs. 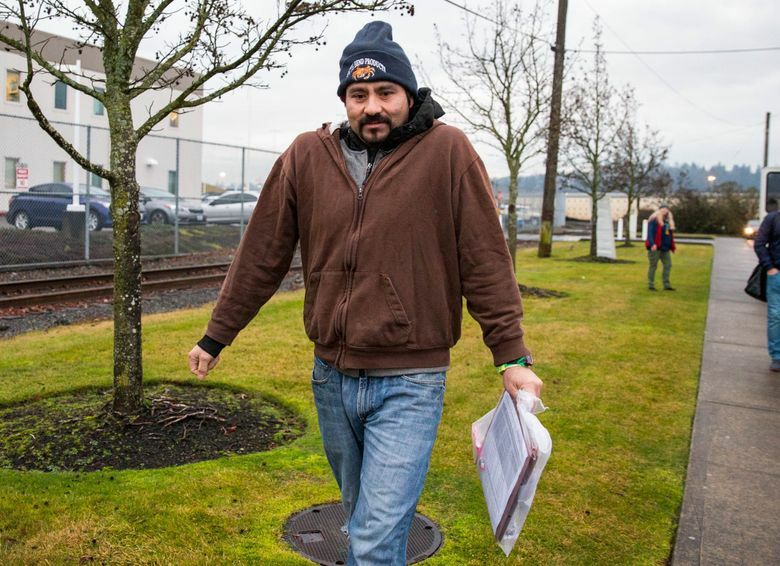 He was held for more than a month at the Northwest Detention Center. In early January, back home in Ocean Park after being released on bond, Aburto Gutierrez said he was surprised to hear about the sharing of licensing information. But he couldn’t help but notice that ICE officers, when they took him initially to their Portland office, showed keen interest in his license. In fact, he said, they cut it up. Marks, the immigration attorney, said he had never heard of that before but routinely has clients whose driver’s licenses are taken by ICE and not returned — a practice he questions because the individuals are legally entitled to the licenses. “State law doesn’t prescribe what law enforcement can or can’t do with evidence obtained during the course of an investigation,” said the DOL’s Anderson. Aburto Gutierrez approached the matter practically. He had to drive. So one of the first things he said he intended to do was apply for a new license.